I'm happy to announce that the unpublished 1889 Secret Doctrine Commentaries of H.P. Blavatsky have now been published!! the publisher/bookshop in the Netherlands. I verified all the info and even ordered a copy through the publishers link to see that it works. Yes there are MANY MORE notes than what was previously published. I should know since I discovered them. I wrote the gist of the following article in 2002 but have slightly updated it several times. Sme of this was published in THEOSOPHICAL HISTORY in 2002. Last update August 14, 2010. "In 1889, when H.P.B. was in London, the weekly meetings of the Blavatsky Lodge was devoted to the discussion of the archaic 'Stanzas' on which The Secret Doctrine is based. Transactions provides . . . H.P.B. 's answers to metaphysical and scientific questions, as stenographically reported, and afterwards revised by her for publication. . . ."
"The . 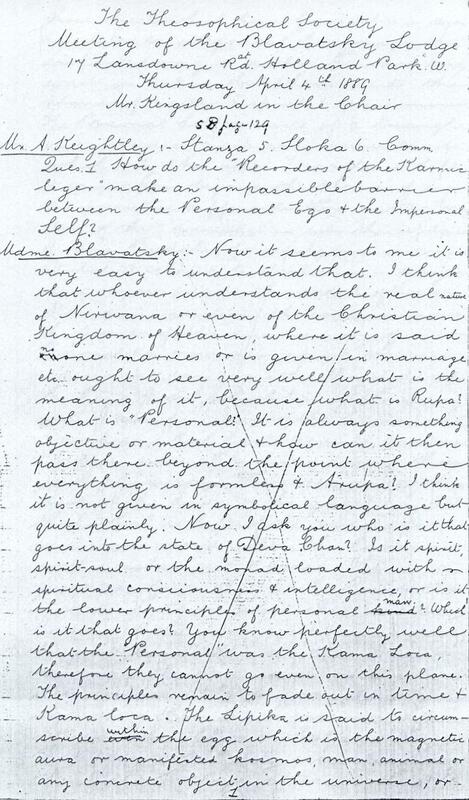 . . transactions are compiled from shorthand notes taken at the meetings of the Blavatsky Lodge of the Theosophical Society, from January 10th to June 20th, 1889, being somewhat condensed from the original discussions." ". . . the members of the 'B.L. of the T. S.' agreed to devote the debates of the weekly [Thursday] meetings to each stanza and sundry other metaphysical subjects." "The questions were put by members. . . . The answers in all cases are based on the shorthand Reports, and are those . . . as given by H. P. B. herself." "...the receptions, the weekly meetings, accompanied by learned discussions, with a stenographer behind my back, and sometimes two or three reporters in the corners, — all this, you can easily believe, takes some time. I must read up for every Thursday, because the people who come here are no ignoramuses from the street, but such people as the electrician K., Dr. William B. and the naturalist C. B. I must be prepared to defend the teachings of Occultism against the applied sciences, so that the reports of the stenographer may be printed, without correction, in our new monthly publication under the name of The Transactions of the Blavatsky Lodge. This alone, the stenographer and the printing — cost my theosophists nearly L 40 a month... Since your departure they have all gone mad here; they spend such a lot of money that my hair stands on end... Don’t you see, they have written a circular to all theosophists of all the wide world: ‘H.P.B.,’ they say, ‘is old and ill, H.P.B. wont stay with us much longer. Suppose H.P.B. died, then we might whistle for it! There will be no one to teach us manners and secret wisdom. So let us raise a subscription for the expenses, etc., etc...’ And so they have raised a subscription and now spend money. And ‘H.P.B.’ sits with holes in her elbows, sweating for everybody and teaching them...." Quoted from Letters of H.P. Blavatsky to Her Family in Russia: Part XII---England 1887-1889. In H.P.B. 's magazine Lucifer, it was noted that the reports of the Transactions (covering the meetings of Jan. 10 through June 20, 1889) were transcribed in "twenty-four large longhand folios." Lucifer, October 15th, 1890, p. 165. "The second part of the 'Transactions -- Blavatsky Lodge,' is now out, and the third [part] will shortly follow." Theosophist, April 1891, p. 438. Italics added. But H.P. Blavatsky died in May 1891 and Part III of the Transactions was never published. It should be emphasized that the discussions in the published Parts I and II cover only the first four stanzas of Volume I of The Secret Doctrine. Part III would, no doubt, have contained H.P.B. 's additional insightful and valuable comments on Stanza V and possibly even on Stanzas VI and VII. What happened to the remaining unpublished Blavatsky material that was contained in the "twenty-four large longhand folios"? This unpublished material would have contained the discussions held with H.P.B. at Blavatsky Lodge meetings from March 21 to June 20, 1889. A total of 14 meetings! More than 15 years ago I discovered the whereabouts of the missing "large longhand folios". Several of the folios were missing but the majority survived. I was allowed to peruse and read the extant folios and discovered that H.P. Blavatsky's discussions and comments on Stanzas V, VI and VII survive after more than 100 years of being lost! I vividly remember the first time I looked at all these manuscripts of HPB's unpublished transactions. On a research trip to California I went to see a certain student of Madame Blavatsky's writings. He brought out the manuscript of the transactions from his garage! I had asked him to show me the mss based on our previous correspondence and phone conversations. He thought all of this material had already been published in 1890 and 1891 and there was nothing else to publish. But from my own previous historical research and from crucial details he had told me over the phone, I knew that was not so and in about 5 minutes I was pointing out to him the various sections that had never been published!!!! The notebooks were all very readable although they were all handwritten. I urged this Blavatsky student then in "charge" of the manuscript to publish this remarkable literary treasure. I was repeatedly assured over a period of years that the manuscripts would be published. A few years passed and I decided to let the late John Cooper, a Theosophical historian, know about my discovery. Since he also knew the "keeper" of the manuscript, I urged John to write him and encourage him to publish this unpublished Blavatsky writing. Nothing came of this so in the summer of 2002 I decided to publish the gist of the above findings in the pages of Theosophical History and then on my website. I also gave a wider circle of students more details about who had this manuscript in the hope that this might result in its eventual publication. One of the unforseen but happy consequences of this disclosure was the publication of the material in one of the unpublished folio notebooks (i.e. for the meeting of April 25, 1889) as a supplement to the September 17, 2002 issue of The Aquarian Theosophist. As of late autumn of 2002 definitive plans were then undertaken by some of the associates of the above mentioned person to finally publish the entire manuscript. Unfortunately, further delays and conflicts regarding the publication of the entire manuscript occurred in the ensuing years. But at last, as of August 14. 2010 the interested student of Theosophy as well as any interested member of the general public can now read this remarkable work. Having just returned from the International Theosophy Conference 2010 in The Hague, I have had the privilege of reading this amazing book, amazing because you feel that you are listening to H.P.B. herself. I know that I would go without many things to be able to afford this book. But that is not to say that I think the pricing is 'wrong' but that the conditions around the publication are not known to us. I saw the efforts of the TS Point Loma BlavatskyHouse in The Hague, with their presses and binding equipment amidst the production of this book. It is a quality production and I cannot believe that a profit was the goal of this work. But since I have no real knowledge of cost factors of paper, ink, glues, and all it takes to bring a book to the point of selling it, I can only speak from a knowledge of the individuals in The Hague involved in this production and I can say that the people involved are sincere Theosophists who have spent their entire adult lives working to share the teachings, never to make a profit. Now that we have printing on demand, at least in the USA, this is the way to go for publications for which the market is small. Some one needs to look at this option once the current inventory is sold. Something is wrong with the business model the publisher has adopted. May be for the Dutch, the price is reasonable. On the other hand, if the decision maker who decided on the price had been a theosophist keen on getting the material to as many theosophists as possible, it would have been priced within reason so that most poor theosophists can buy it. By putting out a high priced book, I will not be surprised if I find a scanned copy on the Internet soon. I hope someone at The Hague is reading the comments here. They need to reduce the price considerably before sales takes off. Too expensive to most of us. I missed the shipping costs. So the total cost comes to Euro 78.95 which converts to $100.74. An alternative for some organization, or Foundation or a wealthy theosophist to buy the rights outright for a fixed sum (everything is up for sale for the right price!) and make PDF version available for free on the Internet. That way it would have a very wide circulation around the world. Hope somebody explores it. PS: I wish the author had made some inquiries with the publishers on the cost issue, because the ultimate objective is see it reaches the widest possible audience of theosophists. Any theosophical knowledge should be accessible to all and not the affluent ones.